Re-issue on cd of the 1987 album. 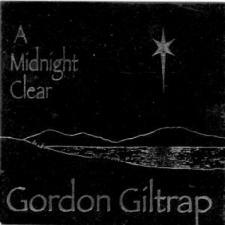 All your favourite Christmas carols given the Giltrap acoustic guitar treatment. The album was issued as a very limited pressing in 1987, on the Modern Music label MODEM 1006, with a different cover. It fulfilled a personal ambition of Gordon's, with it's unique arrangements of Christmas Carols. Due to popular demand it is available again! "Giltrap's playing is spirited and sensitive, as always. His acoustic guitar is the main component here, with Bimbo Acock providing flute and some saxophone, and Ric Sanders of Fairport Convention playing violin on a few tracks. Gordon also programmed some very simple keyboard accompaniment for the songs. His artistic level gives a refreshing look to these old tunes too often dragged around by incompetent music makers. The lack of pretension and simplicity found on 'A Midnight Clear' will appeal to anyone who would like to get back to the spiritual meaning of Christmas." Labels on LP's show title as "Seasons" and have a different cover.